As I look back on my life, I can see a long, sad list of occasions when I tried (and failed miserably) to get by solely reliant on talent. From as early as grade 4, each of my teachers could have cut and pasted the phrase “must try harder” into my report card. And throughout my career, I’m sure that I’ve frustrated a few bosses through my laconic approach to hard work and my inability to organise myself. For many years, I assumed that all I needed was a lucky break or the right opportunity for my talent to shine, without the need to put my head down. Now, don’t get me wrong, I’m certainly not an extraordinarily talented individual, but like everyone, I have natural strengths and abilities that if utilised effectively have the potential to make an impact. But it doesn’t just happen on the basis of talent alone. Out cemeteries are full of people who went to the grave with unfulfilled talent, unrealised dreams and unnecessary regrets. Do something that matters, live with purpose and make an impact. 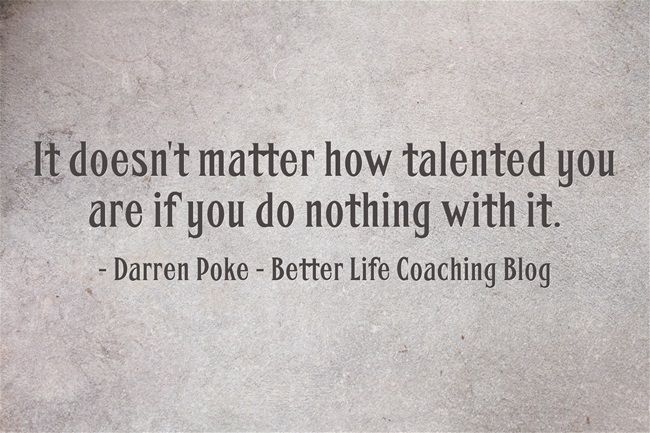 Because it doesn’t matter how talented you are if you do nothing with it.